Looking for a fun, relaxing happy hour after a day of touring Byron Bay? Want to grab a drink but not spend a fortune? Check out our list of the best happy hours in Byron Bay. From 4 to 6pm, The Balcony offers its Sunset Happy Hour with specials on Stone & Wood beer, house wines and spirits and selected cocktails. Not far from Main Beach, you’ll find that you can drink your $6 house wine and enjoy the views, people watch and maybe get an extra cocktail since it’s such great prices. Miss Margarita opened in 2012, and it’s been very popular with both locals and tourists. Make sure to head over right at 5 pm to nab either the $11 classic margarita, $11 mojito or $5 Tecate. When happy hour ends at 6 pm, you can always stay and nosh on some of the Mexican fare. Playfully called “Tappy Hour,” The Beach Hotel’s spin on happy hour involves patrons buying a schooner of tap beer or cider, which will then be upgraded to a pint for free. The happy hour runs from 4 to 7 pm, so stop by The Beach Hotel, which is conveniently located just off Main Beach. The hotel has been around for more than 25 years, and if you come for happy hour, feel free to stay for live entertainment, beer garden and pub food. If you visit this Mediterranean fare restaurant between 4 and 6 pm, you can catch quite a few drink specials to kick off an evening on your holiday. The Mez Club is located in the main town drag, along Jonson Street, so it’s easy to grab a drink here after you finish your other activities. If you like cocktails and live music, you should add The Northern to your list of happy hours to hit up. Any day of the week you can order cocktails for only $12 from 5 to 7 pm. Enjoying the vibe of this cool vintage hotel? Stay for dinner and listening to music, or sit outside and people watch. Plus, if you decide to head back after happy hour, you can always stop by the bottle shop, which is known to be one of the best in Byron Bay with more than 250 beers and ciders and over 500 wines from local, national and international sources. On any day except Sunday, you can head to this favourite foodie/drinks joint and start your evening during the happy hour. Harvest Newry Bar provides a happy hour special from 4 to 6 pm with specials that include $6.50 Stone & Wood tap beers, $8.50 red and white wine or $12 cocktails. After your drinks, you might want to check out the menu, which changes with the season, depending on produce availability. The chefs at Harvest Café utilise only organic and sustainable food to create all the menu offerings. If you’re looking for more information about pubs and bars, check out our blog post that covers 11 Top Byron Bay Pubs to Grab a Cold Brew. 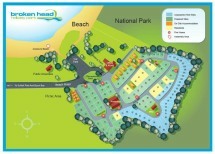 Come for your Byron Bay holiday to check out all of the things to do here, but in order to stay on budget, make your reservation here at Broken Head Holiday Park. We offer excellent accommodation at a reasonable rate that will make you feel good about trying out more than one happy hour special over the course of your stay.